The new year is upon us, and we are moving forward into exciting “unknown territory” as we leave behind the old and ring in the new. For most, ushering in a new year brings joy, excitement, and a feeling of refreshment—even a desire to make new resolutions for life. For others, it is hard to let go of the passing year. This is especially true for those who have lost a loved one. Perhaps there were dreams never fulfilled or a life taken too soon or unexpectedly. There were still dreams to be dreamed. The “bucket list” of things to do did not get checked off. Many individuals and couples have their own bucket lists of things they want to do before they “graduate” from this life. When death touches a loved one, that list can often be placed up on a shelf by the survivors, untouched. As the house is lifted off the ground and floats each day towards Paradise Falls, Carl finds himself coming to grips with his new life and the new people he meets along the way. At one point, he finds it difficult to press on and starts glancing through Ellie’s childhood scrapbook. He is surprised to find that she had filled in the blank pages with photos of their marriage. On the final page, she had written a note from her hospital bed, thanking Carl for their life of adventure and encouraging him to have more of them. The house finally lands on the cliff beside Paradise Falls, enabling Carl to keep his promise to Ellie and to move forward with his new life. As we move forward into the new year, please remember to look “up.” If you find yourself alone due to the loss of a loved one or to personal circumstances, I would encourage you to be like Carl! Take a moment and think of the bucket list that you shared with your loved one or that you have tucked away. You can still dream and find a way to make things happen. Reach out to others, make new friends, volunteer, and take that long-awaited trip. If money is tight, get that coin jar back out and start putting your change into it each day, week, month, and year. It may take time to save for your dream, but you will feel excited to make that dream a reality. Your adventure will not be how you originally pictured it, but life is still worth living and dreams are still worth dreaming. Life is a gift. 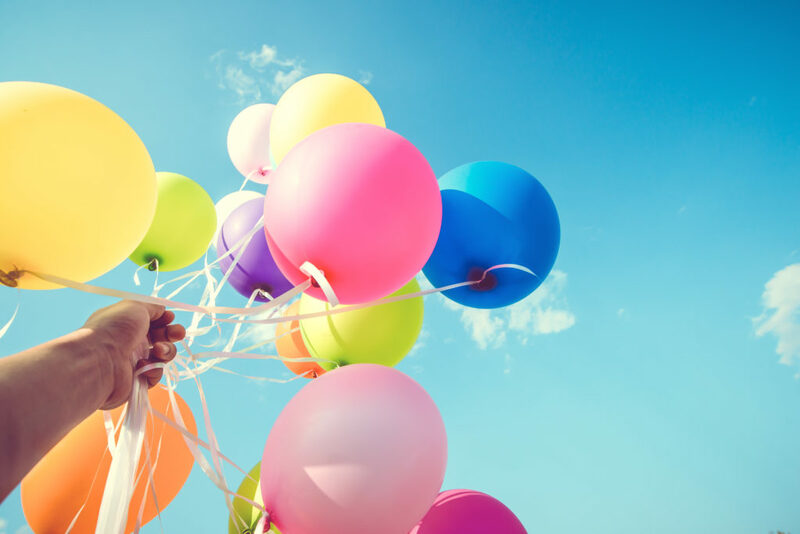 Get those balloons out and start dreaming today!